Contrary to their twee reputation, Belle and Sebastian prove they don't shy away from taking risks with a techno-pop heavy new album. Contrary to their twee reputation, Belle and Sebastian have never been averse to taking risks. If that hadn't been apparent before, it's something that's hard not to notice with the way the iconic Glasgow group previewed its new album with the disco romper "The Party Line", the farthest it has ventured out on the dancefloor up to now. While "The Party Line" wouldn't necessarily incite a backlash from their fanbase, the funkier angle Belle and Sebastian pursued on it is still a bold move for a revered, beloved band that could've easily continued to refine the chamber-pop aesthetic it mastered long ago with no complaints or unmatched expectations. Brave in a way that only the shy overcoming doubt and self-consciousness can be, Belle and Sebastian take a big swing when they could've played it safe on Girls in Peacetime Want to Dance, their ninth full-length. Pretty much the opposite of resting on their laurels for Belle and Sebastian, Girls in Peacetime stands out for knocking you off balance, "The Party Line" proving not to be a one-off anomaly, but the tip of the iceberg for an album that almost begs you to reimagine Belle and Sebastian as Europop stars rather than indie cult heroes. So even though Girls in Peacetime might initially be greeted with some questioning looks, Belle and Sebastian should get credit for leveraging the cultural capital and goodwill they've built up for almost two decades into offering something different, rather than just slipping back into autopilot mode to pleasantly please their devoted audience. Working with producer Ben Allen, whose diverse credits range from Gnarls Barkley to M.I.A. to Animal Collective, Belle and Sebastian sound more colorful and vibrant than ever, at least from a production standpoint. While electronic elements have long been part of Belle and Sebastian's mix, they've never been as up-front and integral as they are on Girls in Peacetime. If only for the novelty, the techno-oriented tracks push themselves to the fore, but they also never come off as forced, as if Belle and Sebastian are doing something new just for the sake of it. Although "The Party Line", which is somewhat meandering and unfocused, may not be the best point of entry into Belle and Sebastian's dance-pop aesthetic, the album's other electro numbers are more tightly composed and have a greater intensity and drive to them, adding a heightened energy to Murdoch's detail-heavy narratives. On "Enter Sylvia Plath", Murdoch's delivery has rarely needed to be so sharp and decisive as it is here, as he keeps pace with pulsating keyboards and galloping percussion. Swaths of atmospheric effects and starry synths set the backdrop for an even more ambitious foray into techno-pop on "Play for Today", which features a duet between Murdoch and Dum Dum Girls' Dee Dee that generates drama out of the interplay between the warmth of his vocals and the dark, stylized cool of hers. While Girls in Peacetime may appear to be a drastic shift in approach for Belle and Sebastian, what they're really doing here is bringing out and foregrounding elements of what they've been up to for a while now, highlighting hidden strengths that have mostly been supporting details and secret weapons in the past. That's particularly the case with the tracks on which Sarah Martin takes her star turn, asserting a more primary role than the back-up vocalist, multi-instrumentalist utility spot she's admirably filled all these years. On the electro-groovy "The Power of Three", Martin flashes her versatility as a singer, ramping up from the thin-pitched confessional vocals she's good for on a song or two on any given B&S album to a dancing queen coo you didn't imagine she had in her. Better yet, "The Book of You" splits the difference between Abba-esque karaoke moves and Belle and Sebastian's own folk-pop tones to end up somewhere in between like a warmer, cuddlier Magnetic Fields, with Martin's oldies-styled phrasing given a touch of showtune-like theatricality. True, the prominence of the electro numbers does make Girls in Peacetime feel a little disjointed at times, especially in the comedown transitioning to pieces more in keeping with the sweetly melancholy pop that no one does better than Belle and Sebastian. But the production, with its emphasis on a bolder, more vivid palette, does lend a sense of continuity to an eclectic album, as the textures of Belle and Sebastian's symphonic pop have a heft and crispness that's sturdier than usual. That's evident on the opening track "Nobody's Empire", on which the familiar orchestration of piano, strings, and soaring backing vocals radiate with a glossier sheen. Though it's an introspective, autobiographical piece on paper, as Murdoch gets personal about his struggles with chronic fatigue syndrome, "Nobody's Empire" never retreats into itself: Instead, the more open sound reaches out to connect you to Murdoch as he relates a particularly vulnerable moment in his life, drawing you in to feel what he went through when he sings lines like, "From this hiding place, life was way too much / It was loud and rough round the edges." 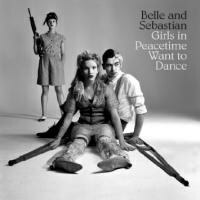 The more expansive production tweaks the inflection of even the most typically Belle and Sebastian songs on Girls in Peacetime. The anxiously up-tempo ditty "Allie" has an amped-up zing and bounce to it as Murdoch warns how "the tricks in your head are a lie," while the tender "Ever Had a Little Faith?" feels particularly poignant as Murdoch utters the title like a rhetorical question to a fluttering violin line. But it's "The Cat with the Cream" that dresses things up most extravagantly, with tremulous strings swelling in their sentimentality. As close as he's gotten to writing a protest song ("Everybody bet on the boom and got busted / Everybody bet and in the government trusted"), Murdoch turns melancholy and malaise into melodramatic orchestral pop. While taking the voices in Murdoch's head and bringing them to life has been the main reason behind Belle and Sebastian building the cult it has, their tent just seems bigger and broader on Girls in Peacetime, as the most individual of stories often seem like they're blown up into widescreen scale here. Even with an identity that's as well defined as any band around, Belle and Sebastian show on their latest outing that they may still have as much potential as history. Although not every effort and experiment on Girls in Peacetime Want to Dance is a fully realized one, Belle and Sebastian's attempt to take on new challenges represents something more important than just the results on the album. As Belle and Sebastian prove here, change and growth don't have to happen as a reaction to the pressure of trends or the threat of obsolescence, but rather as a conscious decision to trust your ever-curious imagination and the essential character that goes with it.